In the fifteen championships between 1946 and '60, St. Eunan's appeared in ten county finals. They won again in '67, splitting the St. Joseph’s threatened five in a row. That was Fionn Gallagher’s final game for St. Eunan’s as he was posted to Limerick in 1967. The Falcarragh man, who had also played for Cloughaneely, had joined St. Conal’s staff as a nurse in 1954, and so strict was the security that he had the devil’s own job persuading a Mrs Treacy that - even though he was a new employee - he should gain entrance! “I felt like I was like going into a jail,” he reminds me. He was a gifted and tenacious right full-back and as we converse in his Mullingar home, I tell him of my old, now departed friend, the legendary Leo Murphy of the double winning All-Ireland Down team, who not only told me once in Rostrevor that the 1960s Donegal team was the best one never to win an Ulster but that Fionn Gallagher was as tough as himself. Fionn, of course, played for Donegal in the Ulster finals of 1963 and 1966, and only lost by two points to Down in the latter game. He played one game at full forward for Donegal and the great Leo Murphy marked him...he recalls that encounter with clarity! He remembers the greats with great affection - Mickey McLoone, Sean Ferriter, Barney Brady, Seamus Hoare, PJ Food and his old St. Eunan’s buddies, Harry Blake, John Hannigan, Peadar McGeehan, Sean Curran and Joe Carroll. 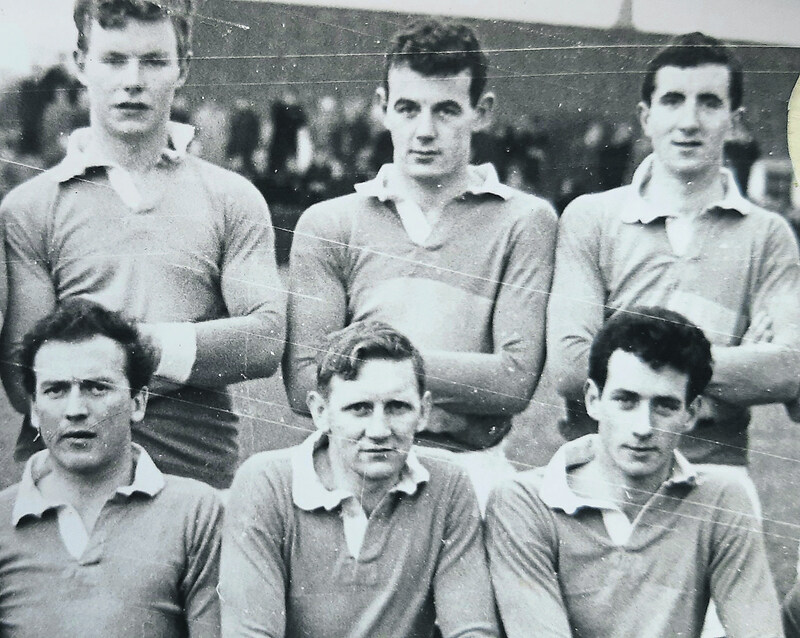 When he was sent to Limerick in 1967, he even played hurling with Old Christians and Na Piarsaigh, but football was his game. He came to Mullingar, St. Loman’s Hospital to be precise, in 1972, and their team at the time, was made up of nurses, army and guards in the main. At the time of writing, they are hot favourites to beat Mullingar Shamrocks in the Westmeath Senior final and Fionn will be cheering a team he played for with great distinction for a number of years. He is also past President of the club and was Chairman of Muintir Thir Conaill (Lar na hEireann) in Mullingar for many years. One of his proudest moments was being instrumental in getting the 1992 Donegal team down in 1993, complete with Sam Maguire. His wife Kathleen laughs: “I slept with Sam Maguire, Frank!” To ensure its safety, she and Fionn kept Sam secure beside the bed! The Donegal team were met by the Mullingar Town Band, before they played Longford and another Donegal man, Eamonn McGowan of the Lake County Hotel, looked after much of the accomodation. There was a raffle for a signed football and their grandson Keith rang from Canada and requested a ticket. He won! Now the ball has pride of place on the Gallagher dresser. Kathleen is a fascinating woman in her own right. A native of Killybegs, Kathleen (Ward) is the niece of Dan Ward of Glenlough, Port, whose stack is an iconic painting by Rockwell Kent, and in whose house Kent stayed...as did poet Dylan Thomas. Not only did the BBC do a great documentary on Port recently but Christy Gillespie will publish a book about the Kent/Ward connection soon. All the Ward brothers ended up in New Zealand and Fionn and Kathleen have visited the country no less than seven times. One of Fionn’s proudest achievements was helping to acquire the three fine pitches St. Loman’s now have. They were blessed when the contractors building the Mullingar bypass gave them the excess road filling which created no less than two pitches, Fionn and the committee already having purchased the first one through donations and fundraising. Fionn and Kathleen have five sons, many of whom continued the football tradition by togging out for St. Loman’s. Like father, like son...Paul is Director of Nursing in St. James’s Hospital in Dublin and Fionn retired in 1993 as Director of Nursing in St. Loman’s. He never misses a Donegal game and was a great friend of the legendary ‘Follower’, Cormac McGill, who was a staunch supporter of the Donegal Association in Mullingar and loved to reminisce about bygone football days with Fionn and others of a fairly extensive Donegal Diaspora in Joe Dolan’s town.